Accueil Produits Bande originale La bande originale de “Le plus heureux des milliardaires”. La bande originale de “Le plus heureux des milliardaires”. Compositeur : Robert et Richard Sherman. Sortie : 14 juillet 2008. Film : Le plus heureux des milliardaires. 1. 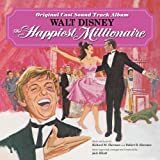 Overture (The Happiest Millionaire) – 2:32. 2. Fortuosity (par Tommy Steele) – 3:12. 3. What’s Wrong with That (par Fred MacMurray et Lesley Ann Warren) – 1:32. 4. Watch Your Footwork (par Eddie Hodges) – 2:36. 5. Valentine Candy (par Lesley Ann Warren) – 3:43. 6. Strengthen the Dwelling (par Fred MacMurray et Biddle Bible Class) – 1:04. 7. I’ll Always Be Irish (par Tommy Steele, Fred MacMurray et Lesley Ann Warren) – 3:08. 8. Bye-Yum Pum Pum (par Lesley Ann Warren et Joyce Bulifant) – 3:08. 9. Are We Dancing ? (par John Davidson et Leslie Ann Warren) – 3:26. 10. I Believe In This Country / Reprise: What’s Wrong With That (par Fred MacMurray) – 0:49. 11. Detroit (par John Davidson et Lesley Ann Warren) – 4:30. 12. When a Man Has a Daughter / Reprise: What’s Wrong With That (par Fred MacMurray) – 1:15. 13. There Are Those (par Tommy Steele, Geraldinie Page et Gladys Cooper) – 2:33. 14. Let’s Have a Drink on It (par John Davidson et Tommy Steele) – 3:45. 15. Finale (Let’s Have a Drink on It) (par Tommy Steele) – 2:08. 16. It Won’t Be Long ’til Christmas (par Anne Shelton et John Aldis Singers) – 3:17. 17. Off Rittenhouse Square – 2:29. What’s wrong with that ? Let’s have a drink on it. It won’t be long ’til Christmas.